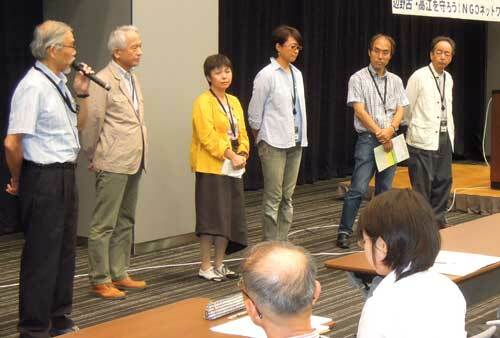 Members of citizens’ groups representing the new network in Tokyo on August 26. On August 26, fourteen NGOs and citizens’ groups established the “Protect Henoko and Takae! NGO Network.” Among the groups participating in the network were FoE Japan, Greenpeace Japan, Ramsar Network Japan, Peace Boat, and other groups and organizations involved in environmental issues, peace, and international cooperation in Japan and abroad. An event was held in Tokyo to mark the network’s establishment. Its goal is to oppose the new base construction in Henoko/Oura Bay and Takae, to protect biological diversity, and to promote sustainable development. The network plans to work in cooperation with local residents and Okinawan organizations in order to oppose the construction of a new base in Henoko, Nago City and the construction of new helipads in Takae, Higashi Village. These projects are being carried out as part of a plan to return the land where U.S. Marine Corps Air Station Futenma sits, and part of the U.S. military’s Northern Training Area, to Japanese administration. Around 160 members of various citizens’ groups attended the event to mark the network’s founding. Representatives of the network spoke of their desire to tell the world about the magnificence of Henoko and Okinawa’s northern Yambaru region, and their hope to increase public interest throughout Japan in these issues. Okinawa University professor emeritus Kunitoshi Sakurai, a member of the experts’ panel that investigated the former Okinawan governor’s authorization of the Henoko land reclamation, gave a commemorative speech at the event. In his speech, he explained problems with the former governor’s authorization, which the panel deemed to be legally flawed.